The international community has said corruption under Buhari is worse that in times past. Nigerians themselves know that murderous herdsmen have joined Boko Haram under Buhari and the economy, which was booming under Dr. Goodluck Jonathan, went into recession under Buhari and has remained comatose. For Nigerians, the 2019 election is not about political parties, particularly as it affects Buhari's presidency. "The election will be Nigerians versus Buhari and not PDP versus Buhari or PDP versus APC, especially knowing how negatively Buhari has impacted the lives of Nigerians." Fayose said with millions of Nigerians thrown out of jobs and an uncountable number of companies folding up on a daily basis, Nigerians in their teeming numbers were waiting for the 2019 election to vent their anger and frustration on what he described as the president's disruptive and destructive policies. "Buhari has damaged Nigeria. He has damaged the lives of an uncountable number of Nigerians. The suffering and untold hardship he has brought on Nigeria and Nigerians is unprecedented. Most importantly, he has destroyed the trust of Nigerians in the ballot box and the people can't wait to send him packing so that they can get their country back. In 2019, the same shocker of 2015 will be witnessed and it will be a ruder shock for those who believed in their mastery of election rigging to remain in power." 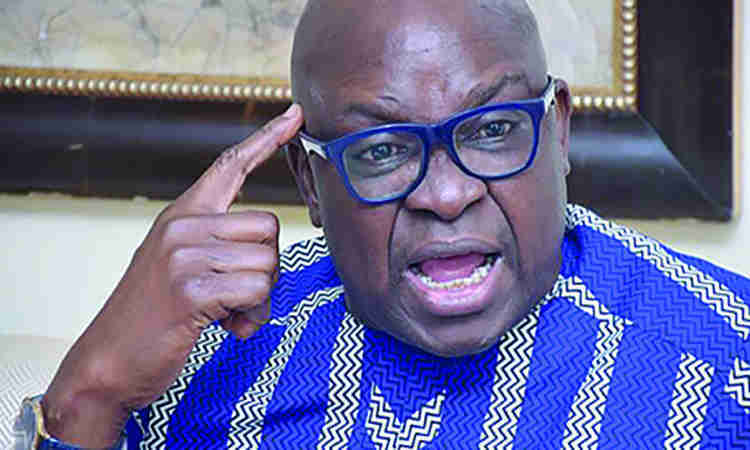 On credibility of elections in the country, Governor Fayose said; "Look at how they subverted the will of the people in Edo, Ondo, Ekiti and the recent Osun governorship elections. The fact they had to rig those elections is a clear testimony that Nigerians have rejected Buhari and his party. They resorted again and again into relying on the security agencies to coerce and intimidate voters. In all the aforementioned elections and other bye-elections across the country, they stole the votes and compromised the electoral process. The European Union, Britain, United States and other election monitoring groups, be it local or international, said as much about the last Osun election." He called on Nigerians to stand up to INEC and insist on credible elections in 2019, noting that "a determined nation must free itself from a dictator who rules by nepotism and oppression."